If you are starting your backyard nursery in August, there are a number of things you should be concentrating on. In the next 8 to 12 weeks there will be some deals on rooted cuttings and liners on the Backyard Growers Business Center Buy/Sell board. If you buy them now and just plant them in a grow bed, which is really nothing more than a garden, sometimes raised, sometimes not. If you have really poor soil it’s better to build a raised bed, which can be nothing more than good topsoil. August is really a good time to get started, you have all fall and winter to prepare some area, plenty of time in the fall to buy plants that you can take cuttings from next spring. And over the winter many of our members sell bundles of unrooted hardwood cuttings. All you have to do is dip them in rooting compound and stick them in a flat, a pot, or right in the ground and they’ll root next spring and be ready to pot come mid summer. Inside the Backyard Growers Business Center we have a Buy/Sell Area that is an awesome place to buy and sell plants. You can buy at wholesale prices, but buy in smaller quantities if you want. September is one of the best months for buying rooted cuttings and liners in the members area. Many growers don’t like shipping in the hot months of the summer so they hold off on all of their sales until September. Lots and lots of awesome deals to be had. Plant the plants that you buy in a bed, then next June, maybe even this winter, you can start taking cuttings from them. Keep them in the bed until you don’t need them for cuttings any more, then dig them up and sell them for a lot more than you paid for them. Make sure you read, “Small Plants, Big Profits from Home” it’s in the Backyard Growers University. That book is the bible of the business side of growing. Some things grow easily as hardwood cuttings, other things not so much, so ask in the members area before you waste your cuttings. Start stock piling hardwood bark mulch so you can mix your own potting soil. 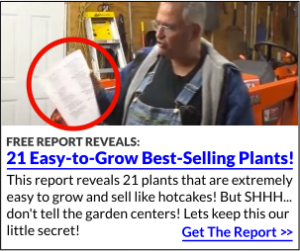 I have a few Potting Soil Secrets that I’ll share with you. You’ll need a lot more potting soil than you think. If you can swing it, Get a Propagation System as soon as you can so you have it ready to go next June. Right now you could use it until cold weather sets in, but for sure, get one long before June. In the spring and summer the parts to make these are difficult to find. Now don’t get overwhelmed. Just pick one or two of these plants to start out with. 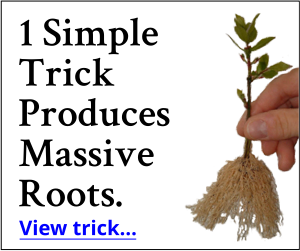 And click here for propagation techniques for most landscape plants. Messages like this Bring Tears to My Eyes. Is A Virtual Nursery Really Possible? Meet A Few Backyard Growers! No time at all really. As you plant more than likely you will be walking or crawling in the bed, that will pack it down enough. If you want you can prepare the bed, the water thorough to get it to settle down, but I’ve never really done that. As soon as the bed is ready I start planting. Be sure to mulch good or use a pre emergent herbicide for weed control. Actually both, the pre emergents work much better when applied over mulch. Something is wrong with the top of my Lavender Twist Redbud… it is all branch and no leaves. Looks a little odd especially to my neighbors. I cut the seedlings off in early summer thinking this would help. I love this little tree. How can I fix my bald redbud? Hope you can see the pictures. Probably a bit of winter damage. As long as the tissue below the bark is healthy the tree will mend itself, all you have to do is keep trimming for shape. This is how you test to see if a plant, or a branch on a plant has died. Just scratch the bark of your plants with your finger nail. If the tissue below the bark is green and firm your plants are fine. If the tissue is brown and mushy that part of the plant is dead. If the top part actually is dead you’ll have to remove it, then train a new branch to a stake to get that height back. Google teaching a lavender twist redbud to be a tree and you’ll find a video that I did.